Every day thousands of Christians are converting to other religions, and heading on the path of destruction. The Lord has given us a vision to evangelize to the people of America and other part of the world. As part of this mission, we are writing the clear Gospel message on the public benches at various bus stops at the different parts of United States as seeds to spread the Gospel. These benches are located at the public bus stops and the busy intersections. “Write the vision: make it plain on tablets, so he may run who reads it”. Habakkuk 2:2. Thanks for your prayer and support. May God Bless you. Please support us with your prayers so that thousands of people can be saved and are blessed. We also need your help to carry on this mission with financial support. All these benches are rented out for one-year contract, and will be renewing every year if God allows. 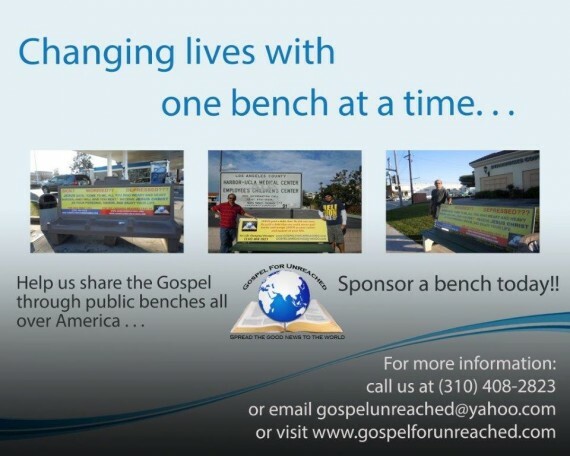 You can be a part of this ministry by sponsoring a bench or sending any contribution as the Holy Spirit leads you.